Tyler Laube is one of the eight members or associates of the Rise Above Movement who were arrested on federal riot charges. One of the eight members or associates of a violent California white supremacist group arrested on federal riot charges has pleaded guilty to assaulting protesters and others at a political rally in Huntington Beach, California, in 2017. Tyler Laube, 22, pleaded guilty on Tuesday in U.S. District Court in central California to a single count of conspiracy to violate the federal riots act over his role in a March 25, 2017, attack on protesters and others, including a journalist, at a Make America Great Again rally in Huntington Beach. Laube admitted to participating in the attack with other members of the Rise Above Movement, what prosecutors describe as a militant white supremacist group. In the plea agreement, Laube admitted that he had engaged in combat training with the group in the months before the 2017 rally in support of President Donald Trump. This story is part of an ongoing collaboration between ProPublica and Frontline. Watch “Documenting Hate: New American Nazis” on PBS on Nov. 20 at 9 p.m. Eastern, 8 Central, and online at pbs.org/frontline. 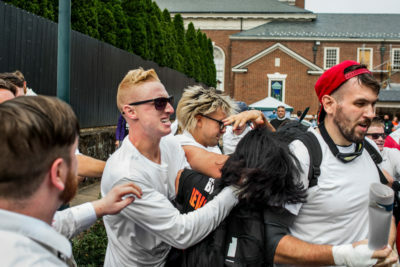 In all, seven other accused members or associates of the group face federal riot charges, either over their roles in the August 2017 “Unite the Right” rally in Charlottesville, Virginia, or in other violent episodes in several California cities that year. The seven men have not entered pleas in their cases. In the plea agreement, prosecutors pledge to recommend a reduction in Laube’s potential prison term, which could have been as many as five years. The plea agreement makes no mention of Laube cooperating with federal prosecutors in the cases against the other men, but it suggests that prosecutors would be satisfied with a sentence of not less than 21 months. A sentencing date for Laube has been set for March 25, the second anniversary of the Huntington Beach rally. “His role in the incident was minimal compared to the other people,” Jerome J. Haig, Laube’s attorney, said. “He was only involved in the Huntington Beach incident and not any of the subsequent incidents, and he wasn’t an organizer or leader on either. The action against the eight men this fall came after months of reporting by ProPublica and Frontline, which uncovered the group, its origins and makeup, and its role in multiple violent episodes throughout 2017. ProPublica’s first article, “Racist, Violent, Unpunished: A White Hate Group’s Campaign of Menace,” raised questions about the law enforcement response to the group’s conduct. A Frontline film in August, “Documenting Hate: Charlottesville,” highlighted the group’s founder, Robert Rundo, as well as another member, Michael Miselis, who was working for a defense contractor and possessed a national security clearance. Rundo is in custody in California, and Miselis is being held in Virginia. In announcing the indictments of four Rise Above Movement members or associates in early October, federal prosecutors cited the reporting done by the two news organizations. Rahima Nasa contributed to this story.